We've been following the Yellow Fever (YF) outbreak in Africa now for several months, starting with Angola in early February, and moving into the DRC in March. Uganda, meanwhile, is dealing with their own Yellow Fever outbreak, which is not epidemiologically linked to the DRC or Angola outbreak. The ECDC's assessment on the The Risk Of International Spread warns of greater international spread of Yellow Fever, and while the risks to most of Europe may be low, the same cannot be said for other parts of the world where competent vectors (Aedes mosquitoes) are more common. Overnight the World Health Organization posted a new update on the YF situation in Africa. I've only included some excerpts, so follow the link to download the full 5-page PDF file. A yellow fever outbreak was detected in Angola late in December 2015 and confirmed by the Institut Pasteur Dakar (IP-D) on 20 January 2016. Subsequently, a rapid increase in the number of cases has been observed. As of 4 May 2016, Angola has reported 2149 suspected cases of yellow fever with 277 deaths. Among those cases, 661 have been laboratory confirmed. Despite vaccination campaigns in Luanda, there is still circulation of the virus in most districts of Luanda and in five additional provinces. 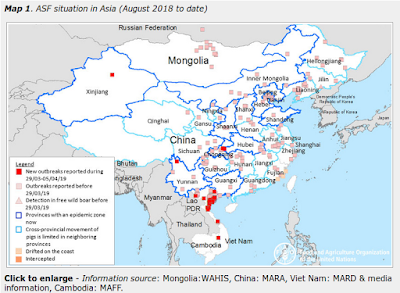 Three countries have reported confirmed yellow fever cases exported from Angola: Democratic Republic of The Congo (DRC) (37 cases), Kenya (two cases) and People’s Republic of China (11 cases). Namibia has also reported a suspect yellow fever case exported from Angola. This highlights the risk of international spread through non-immunised travellers. 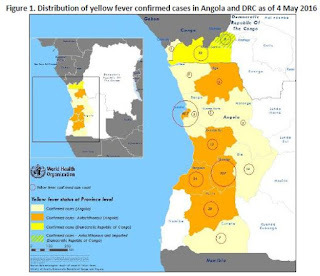 On 22 March 2016, the Ministry of Health of DRC notified human cases of yellow fever in connection with Angola. The Government officially declared the yellow fever outbreak on 23 April. As of 4 May, DRC has reported 5 probable cases and 39 laboratory confirmed cases: 37 imported from Angola, reported in Kongo central province and Kinshasa and two autochthonous cases in Ndjili, Kinshasa and Matadi, Kongo central province. The possibility of locally acquired infections is under investigation for at least 10 non-classified cases in both Kinshasa and Kongo central provinces. In Uganda, the Ministry of Health notified yellow fever cases in Masaka district on 9 April 2016. As of 4 May, seven yellow fever cases are laboratory confirmed in three districts: Masaka, Rukungiri and Kalangala. According to sequencing results, those clusters are not epidemiologically linked to Angola. The virus in Angola and DRC is largely concentrated in main cities and is likely to have been introduced to the cities following increased yellow fever viral circulation among monkeys in the forest. Persistent local transmission in Luanda despite the fact that almost six million people have been vaccinated. Local transmission reported in six highly populated provinces including Luanda. High risk of spread to neighbouring countries. Confirmed cases have already travelled from Angola to People’s Republic of China , DRC and Kenya. As the borders are porous with substantial crossborder social and economic activities, further transmission cannot be excluded. Viraemic patients travelling pose a risk for the establishment of local transmission especially in countries where adequate vectors and susceptible human populations are present. For DRC, a field investigation conducted in April concluded that there is a high risk of local transmission of yellow fever in the country. Given the limited availability of vaccines, the large Angolan community in Kinshasa, the porous border between Angola and DRC and the presence and the activity of the vector Aedes in the country, the situation needs to be monitored with extreme attention.